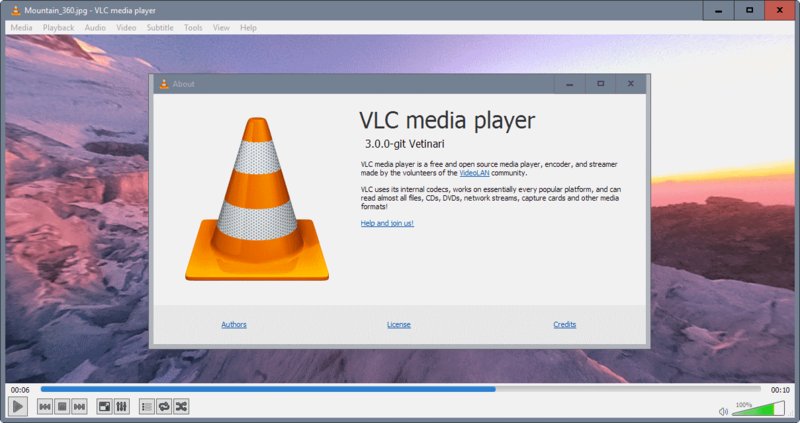 VLC 360 is a preview version of VLC Media Player, a popular cross-platform media player for Windows, Linux, Mac and mobile devices. The preview version is labeled as VLC 360 to indicate that the core feature of the preview is 360 video and photo playback. VLC 360 is provided as a technical preview for Windows and Mac OS X only. The organization plans to release VLC with 360 functionality for all platforms including Android, iOS and Xbox One when it comes out. VideoLAN plans to make use of sensors on mobile devices for navigation. VLC 360 is VLC Media Player at its core plus functionality to play 360° videos and photos. You may know this functionality already from YouTube or other Internet video sites where it is provided if videos uploaded to the site support it. You may download VLC 360 from the project website. Please note that this is a preview and not a final product. If you install it, an installed copy of VLC Media Player may be upgraded to version 3.0. Play 360° videos that follow the spatial video spec. Play 360 photos and panoramas that follow the spherical spec. Supports zoom, little planet and reverse little planet modes. Accelerated with OpenGL and Direct3D11. The project website links to two 360° videos and one 360° photo that you can download to test the functionality. You may load any video or photo that follows the supported specs as well. The new controls enable you to click-drag the mouse to look around in 360° when the video or photo playback starts. You may use the mouse wheel to zoom in or out, or use keyboard shortcuts (Page up or down) for that instead if you prefer to use the keyboard. All playback controls, pause, stop and volume are provided as well in the toolbar and as shortcuts. You may use the preview player as a regular video player as well, as it supports all media formats that the current stable version of the player supports. In other news, VLC will likely support VR headsets -- Vive, Daydread, Oculus or OSVR -- in 2017, and will get support for 3D audio playback including support for head tracking headphones. You can find out more about VLC 360 on the official VideoLAN website. Now You: What's your take on 360° technology? When will VLC get rid of this ridiculous and ugly traffic cone ? It gives off a geeky, basement-made image which is rather at odds with the reference product VLC has become. Did I say it is ugly to the point of being offensive ? Ugly, and totally unrelated to the purpose of the software ? What is wrong with a modicum of good taste ? I personally like the orange cone :) People grew accustomed to it too, you don’t scrap an easily recognisable logo. I vote for No. Irfanview author told me that the logo is a “rode cat” or “road cat” becasue of the tire tracks on it. I like cats. I also like Irfanview. I don’t like the logo. I tend to agree with Yuliya’s comments. Keep the cone. Nah, it’s BB-8’s love child. Kind of neat. I don’t think this is necessary, but I was never into this kind of stuff (except for when using street view, ofcourse). I know my Nexus 4 with Google’s camera can take “photo-spheres”, though I only took a few to test the feature, I prefer a regular photo. I wonder if they’re compatible with VLC. Scroll zooms in/out in VLC. I use VLC as the default media player on Windows 10. I like it. Orange cone and all. You should make an article about it. AAAARRRGGH, ONLY 5 VERSIONS OFF FROM OFFICE 365 INTEGRATION!!!!!! I seem to recall VLC temporarily changed its logo to a red and white stocking cap over a past Christmas holiday timeframe. The uproar from the tropics insured the change would be temporary. I wish they would remember my audio default change; I have to change it every time I start VLC. Oh well, I suppose they have to prioritize their suggestions…. I’ve never seen an “uproar” about it (not that it would surprise me if there were, really), but the Santa hat on the logo has always been a seasonal thing, triggered by a date range around xmas.